If you’re an app marketer or developer, you already know the challenges of getting your app to rank in the app store. This can prove to be a challenge considering there are more than 4 million apps in the Android Play Store and Apple App Store combined. So you try to optimize your app page in an attempt to gain a higher rank in the app store. But marketing your app gets really hard if you’re committing some of the most common mistakes app owners make while trying to optimize their app page. You’ve heard about the importance of keywords in ASO, so you decide to place high-ranking keywords randomly in your app title and description. But just as in SEO, stuffing your content with keywords can end up hurting you instead. Take a look at it from the point of view of a user. You search for a certain type of app and you come across a high ranking one. But what you read makes no sense. Would you download it? Take a look at the example below and see how they’ve used the keyword “emoji” multiple times. 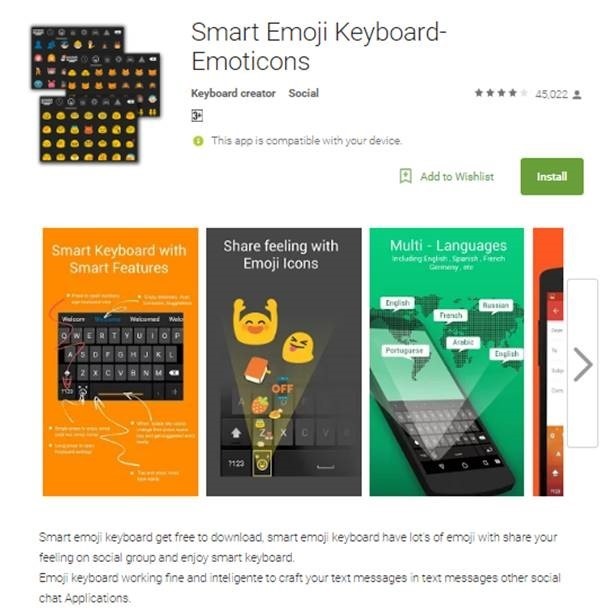 They’ve randomly added “emoticons” in the title and the description doesn’t even make sense anymore. Instead of using as many high-ranking keywords as possible, choose the most relevant keywords and use them to describe what your app is all about. The title and description should both be fluid and natural. Some app owners make the mistake of changing their app title frequently, according to the latest keyword rankings. They believe that this is essential for optimizing their app page. In fact, it can hurt your ranking. Remember that app download volume is an important determiner of its ranking. The more download, the higher it will rank. So you need people to spread the word about your app to improve download rate. If users like your app and want to spread the word about it, they’re going to use your name. What happens if those potential users can no longer find your app because you’ve changed the name? Once you’ve decided on a title with the right use of keywords, stick to it instead of switching it around every now and then. Just like the title, the icon is one of the first things users notice about an app. So your app needs to look appealing while expressing what the app is all about. A camera-themed app icon for a photo-editing app, an envelope-shaped icon for a messaging app, etc. are some good examples. See how Runtastic Running & Fitness app makes use of a running man in its app icon. It sticks to a color theme and doesn’t use more than three colors, making the icon look neat and professional. If you use too many colors and elements in your app icon, it can ruin the aesthetics and make it look unappealing. The icon basically needs to show what your app does while looking visually appealing to prompt users to download. If users like the title and icon, they check out the app description and other elements such as previews, screenshots, etc. It’s not enough to have an interesting and informative app description. Anyone can write a description that sounds highly persuasive, but you need something to support your claim. That’s what screenshots and previews are for; your promise may seem empty if you don’t have compelling visuals to prove it. High-quality screenshots can make a case for your app and encourage more people to take action. 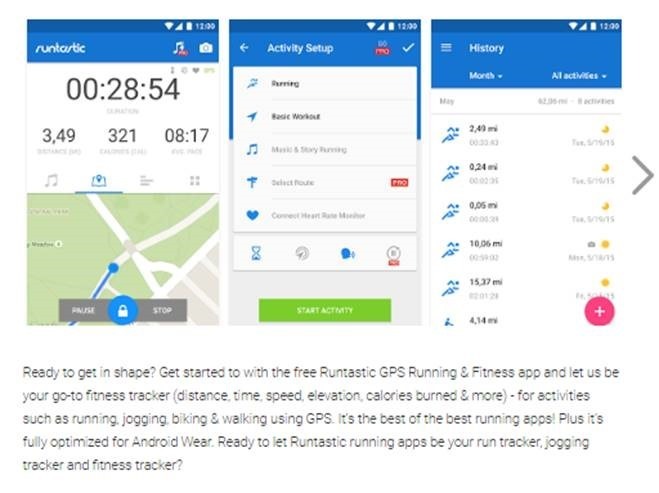 The Runtastic Running & Fitness app also includes informative screenshots that show users what the app looks like. While keyword-based descriptions are among the top ranking factors for apps, it doesn’t mean you only choose keywords with a high search volume. Remember that other app owners like you also target those high-volume keywords. This means that using high-volume keywords isn’t always the most viable solution for your ASO needs. What you can do instead is to compile a list of keywords that are the most relevant to your app. And then you narrow down this list, choosing keywords that have a high search volume but lower competition. While this may be challenging, you can also mix it up a bit and throw in a few keywords with mid to high-level competition every now and then. Finally, one of the major mistakes a lot of app owners make is that they stop their efforts once the results start churning in. It’s easy to make this mistake. You change a few things and make some improvements so you’re able to get more downloads for your app. Now that you’re satisfied with the results, you see no point in making further changes. The truth is that the app store is evolving by the minute – from the emergence of new apps to the changes in keyword ranks. Without continued effort, your app is just going to get back to the slumps and you know how challenging it is to get out of that. Instead of considering ASO as a one-time thing, consider it as an essential, ongoing part of your app marketing. You need to make a continued effort to maintain the ranking of your app. One effective method is by updating the graphical elements like icons and screenshots according to seasonal and holiday themes.